The Farm Bill is Expiring - Don't Leave Us Stranded! This is it. It’s make or break time for the 2018 Farm Bill. Only a few days remain for Congress to finish a new bill or pass a temporary extension of the old one. Either way, farmers and communities are counting on action. What’s at stake? Hands-on training and tools for beginning farmers and ranchers. Support for cutting-edge organic and sustainable research. New infrastructure – like ‘food hubs’ and innovative marketing tools – that helps farmers take advantage of ever-growing demand for local and regional food. There’s a problem, though. Nearly a dozen “tiny but mighty” farm bill programs will be left unable to operate if Congress doesn’t act fast: 140 million dollars for sustainable and organic agriculture, economic development, and beginning and underserved farmer support will literally just disappear. And that’s not all - just over a billion dollars in funding, largely for conservation and farmland preservation, will be frozen too, preventing farmers from accessing help in stewarding their land. Help us tell Congress this is unacceptable – take just 90 seconds to email your Representative and Senators today! Let's WIN a better farm bill in the Senate! The 2018 Farm Bill is on the move! You helped us achieve some great progress over the past several months: this Senate version of the farm bill largely does right by sustainable agriculture, local food, beginning farmers and farmers of color, organics, and more. It is overall a step in the right direction on many issues. Senators Collins (ME) and Brown's (OH) bipartisan amendment #3179 that will make it easier for schools to purchase local food for school meals! Senators Durbin (IL) and Grassley's (IA) bipartisan amendment #3103 that will reduce crop insurance subsidies for millionaires, helping ensure a fair playing field for beginning farmers. Simply dial the Congressional switchboard to be connected to your Senators - (202) 224-3121 - and share a message just like the one below with the person who answers the phone. Fill out the form below to customize and send a message directly to your Senators' offices today. The 2018 Farm Bill is here - and the House version is bad for sustainable agriculture. Right now, in addition to cuts to the SNAP (food stamp) program that our anti-hunger allies have flagged as very harmful, the draft bill makes sweeping, radical cuts to longstanding programs and fails to make needed improvements to others - this could set our shared movement back decades. The bill ravages resource conservation – it erases support for resource stewardship on 70 million acres (that’s an area the size of Nevada!) of working farm and ranchland by eliminating the Conservation Stewardship Program! This voluntary program is overwhelmingly popular with farmers for its ability to improve the health of the land’s soil, water, and profitability. To help farmers protect natural resources and farm sustainably, Congress must reverse its effort to eliminate CSP. The bill guts local and regional food systems - it abandons local farmers by eliminating all funding for three crucial programs. Without the Farmers Market and Local Food Promotion Program, farmers markets and food hubs will lose critical resources. Without the Value-Added Producer Grant Program, farmers will have a harder time growing their businesses by bringing in new sources of income. And with the elimination of the National Organic Cost Share Program, smaller organic farms may not have the support they need to afford to be certified organic. To put us back on track towards a better food future where local farmers feed healthy communities, Congress must RESTORE FUNDING for these critical local food systems programs. Crop insurance and subsidy reforms. The status quo is not enough - now more than ever is the time to invest in these national priorities for a more sustainable food and farm future. Good news: the farm bill isn't final yet, and the Senate is still actively working on their own version that's much better. But right now we need to tell the House: go back and try again. Vote NO on the House 2018 Farm Bill today. Can you send your legislators an email right now? Tell them – these critical issues must be fixed in the farm bill and until they are, the House farm bill is a NO. 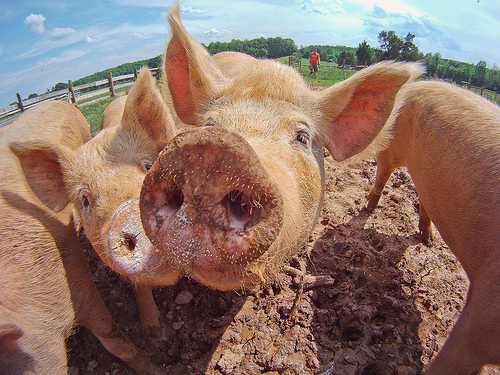 Congress: Cosponsor the Local FARMS Act Today! A new year has begun - and it's a really important one for farmers. Congress will work this year to write the 2018 Farm Bill, which sets the rules of the road for our nation's food and farms! We know that wherever there’s local food, there are farmers feeding communities and creating jobs! Demand is growing from consumers and sales are rising for farmers. Help farmers reach new markets through outreach, cost-share, and technical assistance. Increase access to fresh, healthy, local food among low-income groups and communities in need. Develop new and strengthen existing infrastructure that connects producers to consumers. What happens next? Congress is already starting work on the 2018 Farm Bill – now we need to make sure The Local FARMS Act is included in that package! For that to happen, the bill needs co-sponsors – legislators who will stand up for farmers and communities by showing their support for the bill. Will you ask your legislator to stand up for farmers and healthy communities by supporting local food and farms today? Congress: Cosponsor the Beginning Farmer & Rancher Opportunity Act Today! As this process begins, the farmers and ranchers across the country who feed us are getting older - the average American farmer is nearing 60! Now is the time to invest in the next generation of folks who want to raise our food and steward the land for years to come. What happens next? Congress is already starting work on the 2018 Farm Bill – now we need to make sure The Beginning Farmer and Rancher Opportunity Act is included in that package! For that to happen, the bill needs co-sponsors – legislators who will stand up for farmers and communities by showing their support for the bill. Will you ask your legislator to stand up for the next generation of farmers and support beginning farmers today? As this process begins, the farmers and ranchers across the country who feed us are getting older - the average American farmer is nearing 60! Now is the time to invest in the next generation of folks who want to raise our food and steward the land for years to come. They’re going to be job creators, entrepreneurs, and innovators of the future – provided we help them get the resources and skills they need to succeed. It’s not easy to get into farming – gaining access to land, credit, business skills, and markets is harder than it should be for many beginning growers. Will you ask your legislator to stand up for the next generation of farmers and co-sponsor this bill today? Hello, my name is [your name] and I am a constituent and a voter in [your city]. (And tell ‘em if you’re a farmer!) We need the next farm bill to be a farm bill for the future – I am asking [your Representative's name] to please show your support for the next generation of farmers in our region by co-sponsoring The Beginning Farmer and Rancher Opportunity Act (H.R. 4316) today! Thank you for your time. Tell the Senate to Stand up for Independent Farmers and Ranchers Today! The operator will be able to connect you directly to both of your Senators (one at a time, of course). Simply customize the email below - hitting "submit" will send it to both of your Senators! A Big First Step Forward for Farm to School! Great news! 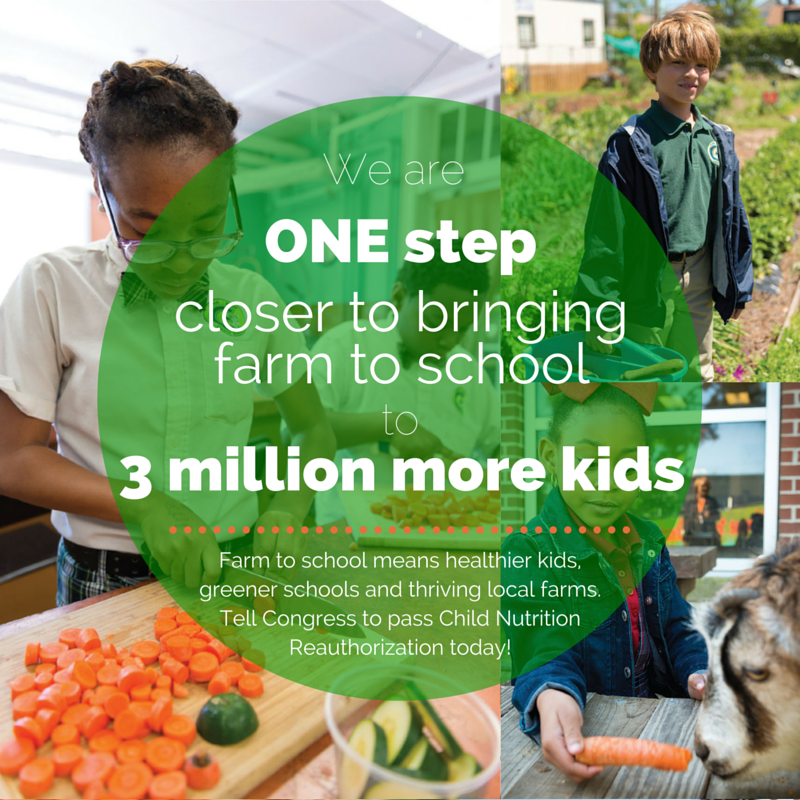 Today we are a HUGE step closer to helping 3 million more schoolchildren get involved in farm to school programs. That means 3 million kids could soon be eating better at school, digging into bountiful school gardens, and learning from local farmers where their food comes from. Here’s what just happened: this morning, the Senate Agriculture Committee voted unanimously to send their draft Child Nutrition Act reauthorization on to the full Senate, and it includes 10 million dollars a year – doubled funding! – for farm to school grants nationwide, along with a host of fixes that will help the grant program work better for schools and farmers. Can you help us THANK Senators who helped champion this issue and encourage the full Senate to move it forward? Congress is about to leave Washington for their annual summer break – but there’s some important unfinished business they need to address first! Earlier this year, lobbyists for Big Meat – the mega-corporations who control most of our nation’s meat production – snuck language into a budget bill that would strip farmers of critical rights and hard-won progress towards a fair, competitive market. 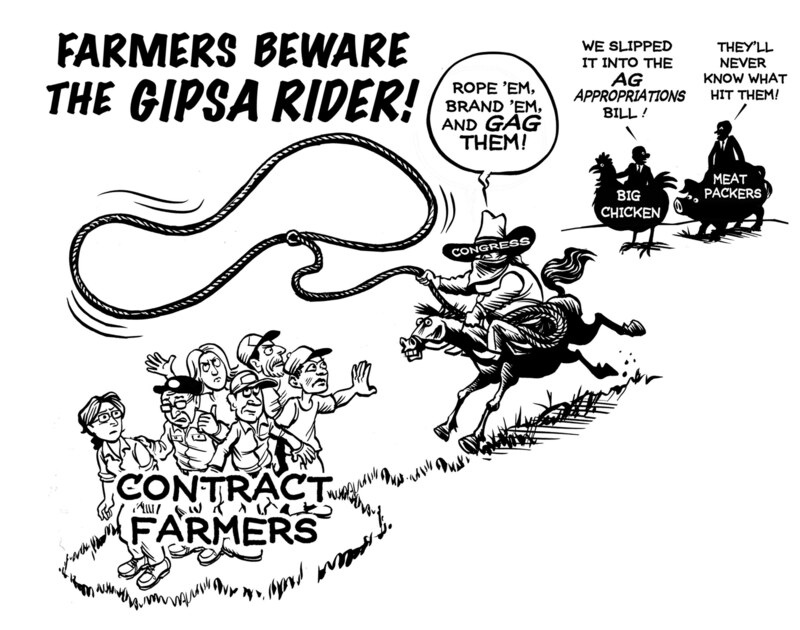 If a budget passes with this secret language – called the “GIPSA* rider” – intact, many independent poultry and livestock producers who contract with meatpackers – the businesses that help them get their products to market – will have no legal protection from retaliation when speaking out about problems. That means if a farmer has a problem and speaks to her member of Congress about it, Big Meat can retaliate by dropping her growing contract altogether – potentially forcing that farmer out of business. And that’s just one of several nasty anti-farmer pieces of this rider! There’s even more... Big Meat has worked for years to silence independent growers in order to maintain their control of the meat and poultry market. Congress is leaving town on Friday – so right now, farmers are speaking up loud and clear to let Congress know they will not be silenced any longer. Will you join us in speaking out for fairness for farmers? Two Senators – Sen. Chuck Grassley (R-Iowa) and Sen. Jay Rockefeller (D-West Virginia) – are taking a stand against the secret anti-farmer rider in the budget bill, and we need your Senators to join them! 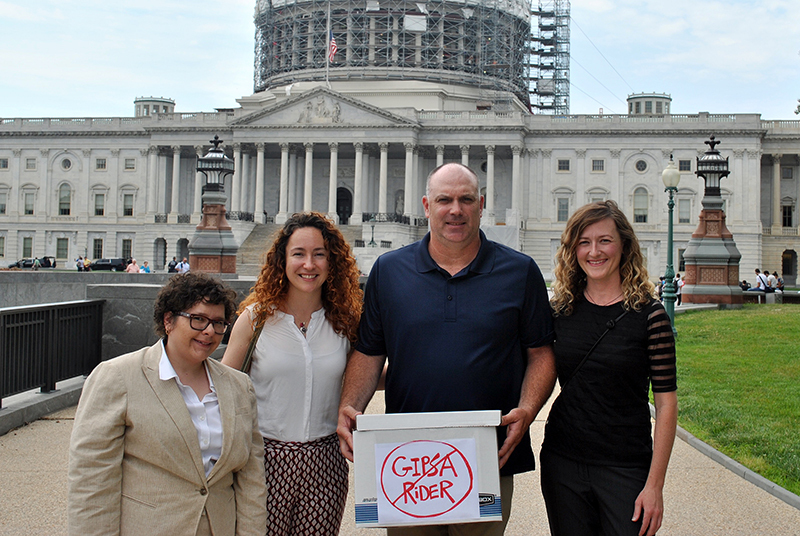 Call or email your Senators TODAY and ask them to sign the “GIPSA Fair Competition Dear Colleague” letter. Their signature on this letter will show Congress that there is broad, bi-partisan support for fairness for farmers. It will help move us one step closer to getting the bad rider out of the budget - and bring independent growers one step closer to fair competition and protection from retaliation. Please customize the email below - hitting "submit" will send it to both of your Senators! Speak out for Fairness for Farmers Today! Big Meat is at it again in Washington. Congress is at work this week on next year’s budget, and wealthy corporate interests have snuck in secret language designed to strip independent meat producers of their rights. This is seriously bad news - and we’ve got to act fast to fix it. Big Meat – the small group of giant companies that process the majority of poultry, pork, and beef in the US – is working tirelessly to maintain their market power at the expense of independent meat producers across the country. The language they snuck into the House budget bill would strip farmers and ranchers of basic legal protections against unfair treatment at the hands of large corporations. For example, if this bill becomes law, independent growers will no longer have legal protection from retaliation, where a corporation can bankrupt a farmer if she raises a legitimate business grievance. These big corporate businesses don’t want to play by the rules of fair competition - they want to change the rules in their favor. If Big Meat wins and USDA can’t enforce what’s known as the GIPSA rule*, independent meat and poultry producers will have no legal protection against outright abuse. We need your help: your Representative sits on the powerful House Appropriations Committee – and this committee has the power to say no to Big Meat! Two legislators are taking a stand by introducing amendments that will remove the worst of this bad language - and they need your Representative to stand with them! Can you make a phone call right now? It takes less than 5 minutes! An email is not as powerful as a phone call, but if you can't call, it's a fine alternative. See a sample email and phone message below! Down to the Wire: Farm Bill Action Now! We're in the home stretch on the farm bill front - the fate of our nation's food and farm policy for the next five years could be set in the next few days! And there's so much at stake – fairness for farmers, long-overdue subsidy reforms, and investments in a more sustainable food and farm future – speak out today by making a call or sending an email now! Note: right now this action is only available to folks whose Senator or Representative sits on the farm bill conference committee. If that’s one of your legislators, you should see a suggested message below. You might need instead to enter your ZIP code to see it! You can customize your message with additional information below, too. Pass a New Farm Bill! And Don't Leave Sustainable Agriculture Stranded! Creating jobs in rural America, seizing new market opportunities, and ensuring the success of the next generation of farmers are national priorities. Let's ensure Congress knows this as they begin conference negotiations on the final version of the 2013 Farm Bill. In the meantime, 10 key programs that represent much of the federal government’s investment in sustainable agriculture are currently stranded without mandatory federal funding due to Congress' inability to come together and pass a new bill. sustainable agriculture programs stranded again! The Clock's Ticking - We Need a Farm Bill Now! For two years (that’s right, TWO YEARS!) we’ve been calling on Congress to pass a full and fair five-year farm bill. We’ve seen two failed attempts, followed by a terrible last-minute extension of the old farm bill at the end of 2012 – one that failed to reform outdated farm subsidies and literally stripped all funding from nearly a dozen critical programs that help farmers and communities. These programs create jobs, invest in our next generation of farmers, and help farmers and communities build a more sustainable future – but they are currently stranded without funding. This is inexcusable - Congress needs to act now. By entering your ZIP code into the box below, you'll automatically send emails to both of your Senators and your Representative! Tell the House: We Need a Better Farm Bill! The House of Representatives is poised to take a giant step backwards this week – away from the kind of future we want and towards unlimited subsidies for mega-farms and corporate agri-business and reduced investments in organic and sustainable farming. An amendment with common sense, long-overdue farm subsidy reforms is on the table right now – and it needs our support. At the same time, outrageously, another amendment proposes to REPEAL a successful program that helps farmers and communities expand and improve healthy food access through farmers markets, food hubs, and other innovative ways to connect farmers and consumers. On the reform front, Rep. Fortenberry’s (R-NE) amendment #93 puts a cap on commodity subsidy payments and closes loopholes that allow mega-farms to collect unlimited payments. Your legislator needs to SUPPORT this amendment. On local food, Rep. McClintock’s (R-CA) amendment #92 would eliminate all funding for the Farmers Market and Local Food Promotion Program. Your legislator needs to OPPOSE this amendment. TO SEND AN EMAIL: Enter your contact information below; it will automatically send the email to your Representative based on your ZIP code. Protect and Support Conservation Programs! In the face of the most disastrous, widespread drought in a generation, what’s the worst possible thing Congress could do? Play politics with disaster aid? It’s happening. Cut conservation programs – the very ones that help farmers protect themselves from the worst ravages of drought? It’s about to happen. Help us tell Congress this is unacceptable – call your Representative and Senators today and tell them: we need a farm bill now that funds conservation! And don’t pay for disaster aid by cutting conservation! and We Need it Now! This is it. It’s make or break time for the 2012 Farm Bill. Farmers and ranchers from across the country are rallying on Capitol Hill today. We need your voice too! But the 2008 Farm Bill expires on September 30, and if Congress doesn't pass the 2012 Farm Bill - or extend the '08 bill, along with funding for critical programs - hundreds of millions of dollars for sustainable agriculture, economic development, and beginning farmer support will literally disappear. The Conservation Stewardship Program Needs Your Help! If the Conservation Stewardship Program (CSP) is helping you implement practices on your farm that reduce soil erosion, increase wildlife habitat and save energy while allowing you to continue to run a profitable farming enterprise, then now is the time to tell Congress. The House Agriculture Committee is scheduled to vote on their version of the farm bill the week of July 9. In the Senate Farm Bill, the Conservation Title was cut by $6.4 billion over 10 years and Conservation Stewardship Program was cut by $2 billion, reducing enrollments by 2.5 million acres each year. This is already an excessive hit to this very popular and effective program that supports conservation on working farmland. Yet we expect an even bigger attack on the Conservation Stewardship Program in the House Agriculture Committee. Committee spokespeople have indicated the House bill will cut CSP considerably more than the $2 billion. If these cuts are enacted it will not only dramatically reduce the opportunities for new farmer/ ranchers to enroll in the program, but will also limit the re-enrollments for those already in CSP. These cuts would mean that once a producer’s 5-year CSP contract ends getting another contract will be much more difficult and less likely. Please call the House Ag Committee member(s) from your state right away. They represent farmers and agriculture interests not just in their districts but for your entire state and need to hear from you. We’re asking farmers and ranchers who care about the Conservation Stewardship Program to push back against attempts that would further scale back the program. Who will grow food for future generations? The current farm population is aging rapidly, and while there are many people who want to farm and ranch they face tremendous obstacles entering this field. To ensure a healthy, safe, and prosperous future America urgently needs new farmers. 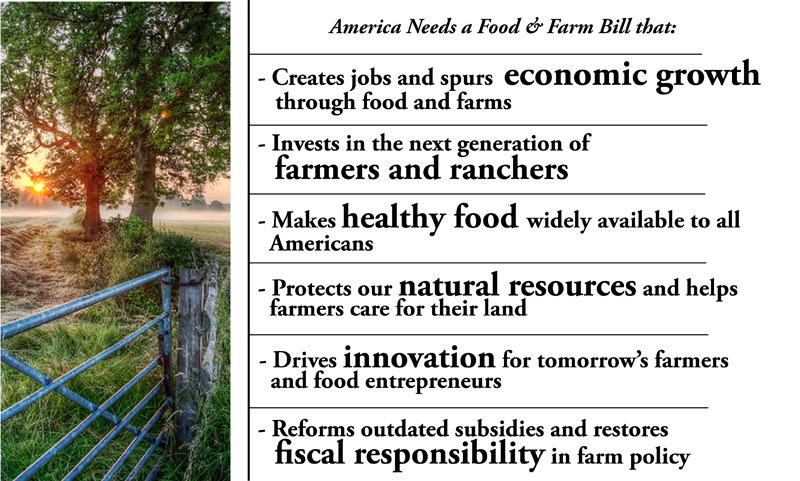 Ask your two Senators and Representative Co-sponsor the Beginning Farmer and Rancher Opportunity Act (BFROA) of 2011! This is our chance to break down barriers that impede new agriculture entrepreneurs from starting a farming business. BFROA would improve existing credit programs so young and beginning farmers can access the financing necessary to run their businesses. It would reauthorize important conservation programs that foster new life-long stewards of the land and encourage innovative strategies for land transfer and farm entry. The bill also invests farm bill dollars in training veterans who want to launch a ranching or farming business. Once you enter your zip code, the correct names and phone numbers will pop up so you can address your call to the appropriate recipient! >First check here to see if your Senators or Representative have co-sponsored the bill. If not, put in your zip code below to call them! >Ask for the staff member who works on agricultural issues. If the agriculture staffer isn’t available, leave a message and have them call you back. I am a constituent. I am calling to urge Senator/Congress(wo)man __________ to co-sponsor the Beginning Farmer and Rancher Opportunity Act of 2011. This legislation was recently introduced in the House and Senate. It will help new farmers and ranchers get started in agriculture. It’s a job creator and a cost effective smart investment. Investing in the future of agriculture is not a partisan issue, it benefits everyone. Can I count on Senator/Representative________ to be a co-sponsor? -If your Senator will co-sponsor or wants more information: Tell them to communicate with Senator Tom Harkin’s office. - If your Representative will co-sponsor or wants more information: Tell them to communicate with Representative Tim Walz’s office. P.S. It is possible agriculture staffers will ask for a copy of the bill or for additional information. Feel free to share the summary of the bill at this link. It was introduced in the House by Rep. Tim Walz (D-MN-1) and Rep. Jeff Fortenberry (R-NE-1), and in the Senate by Sen. Tom Harkin (D-IA), along with nine original co-sponsors. Please act today for a chance you have only once every 5 years to truly transform our food and farm system and protect our natural resources through the federal farm bill. If you call: Phone calls are much more potent! If the line is busy, please leave a brief message on the voicemail. The simple message to address to each representative that appears after you enter your zip code: I am a constituent. I have heard the Agriculture Committees are trying to write the farm bill this week, behind closed doors. I urge Senator _____/Representative _____ to speak out and oppose any farm bill deal that makes big cuts to conservation and nutrition programs, fails to restore funding for local food and beginning farmer programs, or keeps subsidizing commodity production without strict per farm limits. Use the talking points below to guide you. • The proposed farm conservation cuts are too big and should be reduced. In particular, the Conservation Stewardship Program funding should be retained and Wetlands Reserve Program funding should be restored. • Farm commodity program reform should include caps on the amount of subsidy any one farm can receive. Loopholes allowing multiple subsidy payments to single farms should be closed. Conservation requirements should be attached to all forms of revenue and crop insurance subsidies. • The farm bill must reinvest at least $1 billion a year in innovative, job-creating programs for rural economic development, local and regional food systems, renewable energy, organic farming, and young and beginning farmers. The Super Committee has unprecedented power and is making choices right now. The budget cuts could determine the future of food, farming, and the environment for a decade or more! Both your Senators will be advising the Super Committee and making decisions quickly. Please call today. Once you enter your zip code below, the correct names and phone numbers will pop up! - Farm conservation and environmental programs have already been cut deeply and should not be cut any further. P.S. If the line is busy, please leave a brief message on the voicemail. Your Representative and both your Senators will be advising the Super Committee and making decisions quickly. Please call today. Your Senator will be advising the Super Committee and making decisions quickly. Please make a phone call today. Ask your Two Senators and your Representative to Co-sponsor the Beginning Farmer and Rancher Opportunity Act of 2011! • When you call a Senate or House office, ask for the staff member who works on agricultural issues. If the agriculture staffer isn’t available, leave a message and have them call you back. • I am a constituent, calling to urge Senator/Congress(wo)man __________ to co-sponsor the Beginning Farmer and Rancher Opportunity Act of 2011. This legislation is being introduced in the House and Senate next week. It will help new farmers and ranchers get started in agriculture. It’s a jobs creator and a cost effective smart investment. Can I count on Senator/Congress(wo)man_________ to be a co-sponsor? Once you enter your zip code and address below, the phone number for your Senators and Representative will pop up! Who will grow food for future generations? The current farm population is aging rapidly, and while there are many people that want to farm and ranch they face tremendous obstacles entering this field. To ensure a healthy, safe, and prosperous future America urgently needs new farmers. Next week the National Sustainable Agriculture Coalition (NSAC) will be joining members of Congress and other farm groups in introducing the Beginning Farmer and Rancher Opportunity Act of 2011. The Beginning Farmer and Rancher Opportunity Act of 2011 is a jobs creator that helps new farmers and ranchers get a start. This is a remarkable opportunity to break down barriers to entry and give real support to aspiring farmers across this nation. It will expand and improve upon proven programs that provide tools and incentives to ensure the effective start-up and success of small and mid-sized family farmers across the country. Your Representative and Senator will be advising the Super Committee and making decisions quickly. Please call today. Your Representative will be advising the Super Committee and making decisions quickly. Please make a phone call today. On Tuesday, June 28th participate in the National Day of Action to protest the huge cuts to farm bill conservation programs and prohibitions on support for local food in the House of Representative-passed spending bill. Your Senator needs to hear from you that the federal budget shouldn't be balanced on the back of conservation programs. It’s easy to call: Enter your zip code in the box below to get phone numbers for your Senators. Call both of your Senators and ask to speak to the staff member responsible for agriculture. If the staff member is unavailable leave a message with the receptionist or a voice mail message. Be sure to identify yourself as a constituent and a farmer or a consumer and to leave a call back number. Message: Tell them the Senate needs to protect farm bill conservation program spending and programs essential to promoting local and regional farm and food systems. Tell them the House agriculture spending bill is extreme and unfair. 1. The Senate needs to protect farm bill conservation programs from further spending cuts. Conservation programs were cut by $500 million in fiscal year 2011 and the House is proposing an additional cut of $1 billion for fiscal year 2012 to the Conservation Stewardship Program, the Environmental Quality Incentive Program and the Wetlands Reserve Program. These cuts will require USDA to break contracts with farmers who have committed to conservation practices and they are disproportionate to other spending cuts. 2. Conservation programs are consistently oversubscribed with long waiting lists of farmers wanting to implement conservation systems. Conservation programs are effective - creating jobs while protecting our future agricultural capacity for future generations. 3. Conservation program spending has been slashed while funding for commodity programs remains untouched. If cuts to mandatory funding are to be made, then everything has to be on the table. 4. The Know Your Farmer, Know Your Food initiative (KYF, KYF) provides crucial coordination and public outreach to build new income opportunities for farmers producing for the local and regional markets. These markets are essential to rural economic recovery and cutting KYF, KYF is shortsighted and extreme. 5. Development of local and regional food systems and markets is a job creator and a good investment in public health. The most powerful “Big Ag” players in the leafy green industry are pushing the National Leafy Greens Marketing Agreement (NLGMA). The sellers, processors, and distributors that sign on to the rule will require that the farmers they purchase from comply with its standards. The rule adds a second and conflicting layer of food safety standards and audits on top of FDA food safety rules. of the leafy greens market. Tell the USDA's Agricultural Marketing Service (AMS) to withdraw their unnecessary and confusing rule. Add your comments to the box below and then click on the submit button. Use the following talking points to help compose your comment. It is best, however, if you use your own words. 1. The Agricultural Marketing Service is NOT a food safety agency and it should leave food safety regulation to the Food and Drug Administration. AMS staff is made up of economists and marketing specialists who convene industry to reach agreement on orderly marketing of produce. They are NOT food safety scientists. 2. The governance structure for this agreement is dominated by processors and distributers and provides only token representation for farmers and consumers. The standards developed under this rule are likely to be driven by the most powerful voices and the largest players in the leafy greens market to the detriment of small and mid-sized farmers and processors. 3. Consumers expect food safety standards to apply to all produce, not just those subject to a marketing agreement. Food safety should not be used to gain a competitive advantage in the market place. 4. If a final rule is issued it should include those provisions in the Food Safety Modernization Act (FSMA) that provide food safety alternative compliance measures for small and mid-sized producers and processors. Food safety must be achieved without obstructing the growing interest and investments in producing for local and regional food systems. Broad access to these growing markets is vital to rural economic recovery, public health and nutritional well-being. Making a phone call to your Senator can be one of the most effective ways to influence their votes and their opinions. And it has never been more important to pick up the phone and let Senator Kohl know what you think. SARE and NSAIS can be powerful engines for rural economic recovery but only if they are funded. SARE funding has been stagnate for years and NSAIS was completely defunded in fiscal year 2011.
and he will soon be making critical decisions about fiscal year 2012 funding. Making a phone call to your Senators and Representative can be one of the most effective ways to influence their votes and their opinions. And it has never been more important to pick up the phone and let them know how important these programs are to your farm and your local or regional economy. Fiscal year 2012 is a critical year for programs that support sustainable and organic agriculture and we thank you for making the call. Please take a minute to let us know how the call went. Type your report directly in the letter box below. Your message will go directly to NSAC. Senator Schumer: Where are Your Priorities?!! Tell Senator Schumer it is not OK to slash Farm Bill funding for conservation programs! On Sunday, the number three ranking Democrat in the Senate, Senator Chuck Schumer of New York, went on national TV to tell the country that Senate Democrats want to cut mandatory spending from the 2008 Farm Bill farm programs. The only cuts to Farm Bill funding currently on the table are the programs designed to conserve natural resources and protect the environment. Senator Schumer needs to hear that slashing funds that protect water quality, create wildlife habitat, save farmland, and promote a more sustainable agriculture is not the right choice for Senate leaders to be promoting. The appropriations bill being debated by Congress is not the right place to deal with Farm Bill spending -- the 2012 Farm Bill is the right place. But if the Farm Bill must be cut in advance of 2012, then everything needs to be on the table including the $5 billion spent on commodity subsidies in the form of direct payments - payments that go to farmers and landowners regardless of need and without regard to crop prices. Please ask Senator Schumer to get his priorities right. Write immediately. The congressional budget negotiations are heading into their final day. Type your letter in the blank box below. Use the letter below only as a sample. It's important that you use your own words. You already know that if the House gets its way programs that are building a healthier, more just, and environmentally sustinable food and farming system will get thrown under the bus. But guess what? The Obama Administration appears ready to propose even deeper cuts to conservation programs than the Republican House! Someone has to be the voice of reason here. Don’t let the Administration gut innovative programs that reward farmers for environmental stewardship and protect fragile wetlands while leaving unscathed the $5 billion dollar a year that is spent on production subsidies in the form of direct payments – payments that go to farmers and landowners without regard to need or even crop price levels. Tell U.S. Department of Agriculture Secretary Vilsack to stand up for the Conservation Stewardship Program and the Wetlands Reserve Program. If cuts are to be made then everything has to be on the table –a budget package that singles out conservation is shortsighted and unfair. Your emails make a difference! "I urge Secretary Vilsack to stand up for a responsible and equitable budget. As the White House negotiates with Congress on Fiscal Year 2011 funding, I am writing to ask you to stand up for the Conservation Stewardship Program and the Wetlands Reserve Program. Please take the lead in defending the farm bill’s conservation programs from unfair attacks by the White House and the House of Representatives." Thank You for Calling President Obama! The Grain Inspection Packers and Stockyards Administration (GIPSA) has issued new rules that define and prohibit some of the worst corporate practices in the livestock industry. You can comment on the new rules by typing directly into the box below. Its best - and most effective - if you use your own words. Tell USDA to stand firm and to not weaken the rules. Tell them that we need strong rules to curb corporate control over livestock and poultry markets. We need rules that foster fair prices for farmers and ample opportunities for farmers and ranchers to pursue value-added products that respond to consumer demand for high quality food. Aggressive enforcement of the Packers and Stockyards Act is essential to these aims. All of us who care about our nation’s farmers and ranchers must tell our Senators that we support USDA’s proposed rules to restore competition and contract fairness to livestock and poultry markets. • Urge them to support the USDA proposed rules that restore competition and contract fairness to livestock and poultry markets. Tell them we need a level playing field for family farmers and ranchers. • Urge them to Contact USDA Secretary Tom Vilsack and express their support for proposed rule. All of us who care about our nation’s farmers and ranchers must tell our Representatives that we support USDA’s proposed rules to restore competition and contract fairness to livestock and poultry markets. • Urge them to Contact USDA Secretary Tom Vilsack and express their support for the proposed rule. The CRP Transition Incentives Program, will offer incentives to land owners at the end of their CRP contracts to sell or lease the land to beginning and minority producers using sustainable or organic farming practices. Please urge the Farm Services Agency (FSA) to do all it can to promote the program among beginning farmers seeking land and farmers whose contracts are expiring. Use the letter below as a guide but edit the letter to put the comment in your own words. Help Make the Next Generation of Biofuels Sustainable! You can type your comments directly into the box below. It's best to use your own words but feel free to use these talking points to inform your comment. 1. Target BCAP Project funding to projects that establish perennial crops and trees, with participating farmers who have a conservation plan approved by USDA’s Natural Resources Conservation Service that addresses soil, water quality, wildlife habitat and other resource concerns. 2. Give a higher priority to BCAP Projects that include local ownership of the biomass facility, demonstrate local economic benefits, and include the participation of beginning or socially disadvantaged farmers. b) If CHST funding is not limited to BCAP project land, CHST funding should only be allowed for new sources of biomass and only in instances where the biomass allows a bioenergy facility to produce additional renewable energy. CHST funding should not be used for residues from any crop that is eligible for Farm Bill commodity program payments. Please consider adding your organization’s name to our letter urging Secretary Vilsack to make critical improvements to the Conservation Stewardship Program and to initiate a 2010 Sign up as soon as possible. Deadline COB March 10th. Sign on by scrolling to the bottom and submitting your contact info or send an email to Annette@sustainableagriculture.net. Please include "SARE Sign On" in the subject line of your email.